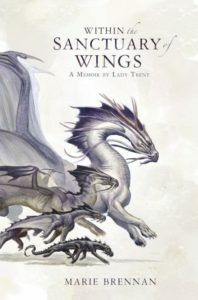 I’m a huge fan of the Memoirs of Lady Trent series, and I’ve been waiting for this concluding volume, Within the Sanctuary of Wings, for a long time. This series stars Isabella (Lady Trent), pioneering female dragon naturalist, in a secondary world reminiscent of the Victorian era. Isabella has trekked all over the world in pursuit of dragons, and this installment is no exception – she’s chasing a rumor of a new dragon species to the inhospitable Mrtyahaima mountains, home to the tallest peaks in the world. And of course she’s also getting mixed up in international politics along the way. One of the reasons I like these books so much is that the climax is always about discovery – sure, there’s adventure, action, and near disaster, and maybe the story wouldn’t be so compelling without them, but lots of books have those. Isabella’s drive to learn more about her world is what makes her story stand out. The previous four books have been slowly building up to a great draconic revelation and I was eager to find out what it was. In retrospect, it ended up being obvious (a fact that Isabella alludes to in her narrative), but the author has been doing such a good job of building up the world and the rules that it operates on that I was as amazed as the characters. Other than that, I don’t have much to say about this book. If you haven’t read this series, start at A Natural History of Dragons and keep going. If you have read the series, this is a great conclusion, it’s satisfying and there are no loose ends, so stop reading my review and acquire the book!